Ahhh… we’ve reached the pinnacle of The Dirty Blondes‘ videography, and this one may be a bit of a keepsake. You know, if videos of the city’s most out-of-control and raunchy punk band can be. Ranald is back with his last installment of our countdown of The Top 5 Dirty Blondes Videos of All Time, and you can partake in the fornication-inducing awesomeness after the break. Call us fans of crazy ideas, and especially fans of local-musician enthusiasm. Geez, someone hasn’t had their morning coffee. Anyway, when we got back from last night’s Primer 55 show at The Outland Ballroom we were greeted with a gem of a brainstorm sitting in our inbox courtesy of Ranald Ives Cummings III. You may know Cummings as the singer for the local punk rock group The Dirty Blondes, and you may also know the Blondes are playing their going-away show this Friday night at The Outland Ballroom with The Disappointments (also playing their last gig/CD release party) and Pilot Whale (who had better not be playing his last gig). With the big show coming up, Cummings wrote us with the idea of a countdown of the five best Dirty Blondes Videos (aka DBVs; sort of like WMDs only the UN is more likely to find them) with #1 debuting Friday morning. Cummings even wrote them all out. Brilliant, yes? Well, he forgot one important detail: By sending it in overnight Monday, the countdown is set back a day. What’s the fun in playing the best-ever Dirty Blondes vid once the band no longer exists? Not ones to let a good plan go to waste, we’ve decided to get things back on track by giving you the bottom end of the countdown–i.e. the first two videos–on the same day, followed by the last three one at a time and ending on Friday as intended. 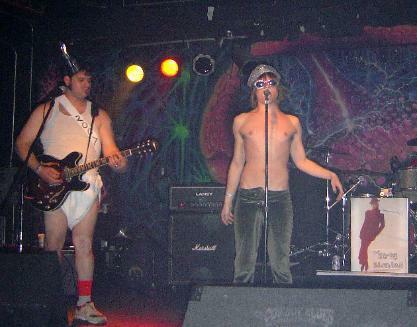 So who’s ready to see some less-than-fully clothed, sometimes cross-dressing men play libido-infused punk rock?! Ran takes the reigns after the break.